This past year, we have started doing “Family Dinner” each week, something Leah explained in detail before revealing her delicious dark chocolate and coconut cookie recipe. So my first time through, I made my go-to dish, the already-covered Penne a la Vodka. There are a few other dishes in my arsenal, but nothing that would be easy to serve to 7-8 people. So I started digging. I wanted something that would stand up to all the outstanding food everyone else has made, but was also easy enough for me to make after my once-every-other-week chemistry lab. (I promise I washed my hands afterward!) 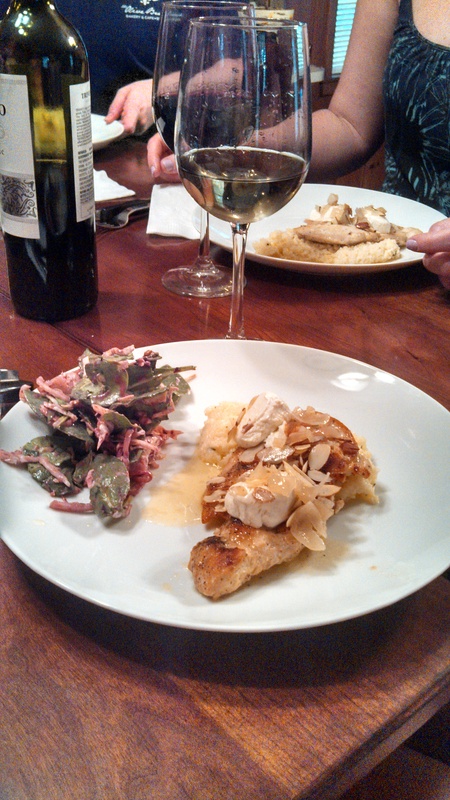 I settled on my mother’s chicken with goat cheese, toasted almonds, and roasted peppers. Honestly, I don’t care for peppers with this dish and I picked them off as a child so when it came my turn to cook, I didn’t include them. I’ve kept them in the recipe for anyone who might like them. 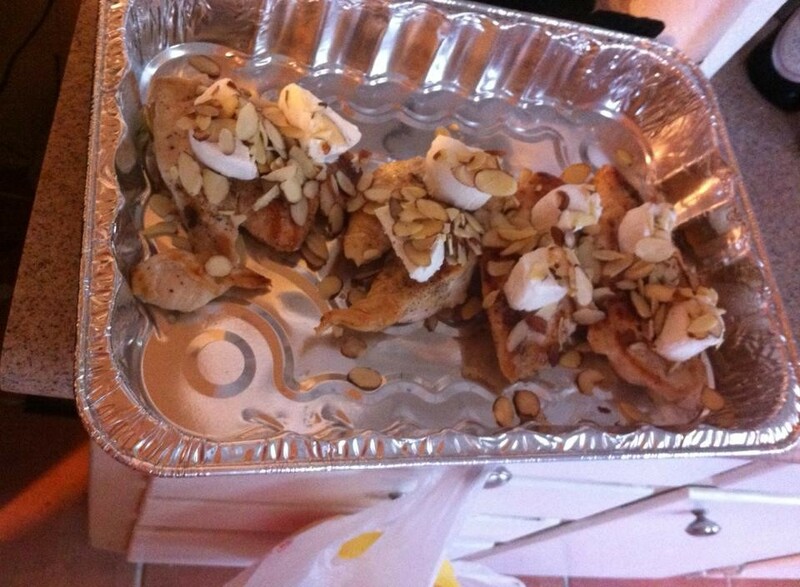 Toast almonds: place in heavy ungreased pan over medium heat and stir until lightly browned. Place chicken breast(s) between two sheets of plastic wrap and pound to an even thickness. Sprinkle with salt, pepper and garlic powder to taste. Preheat broiler. Arrange pepper on baking sheet and broil until skin blackens. Place in a plastic bag and let stand for 10 minutes. Remove, peel peppers and cut into strips. Preheat oven to 350 degrees. Put 2 Tbsp. 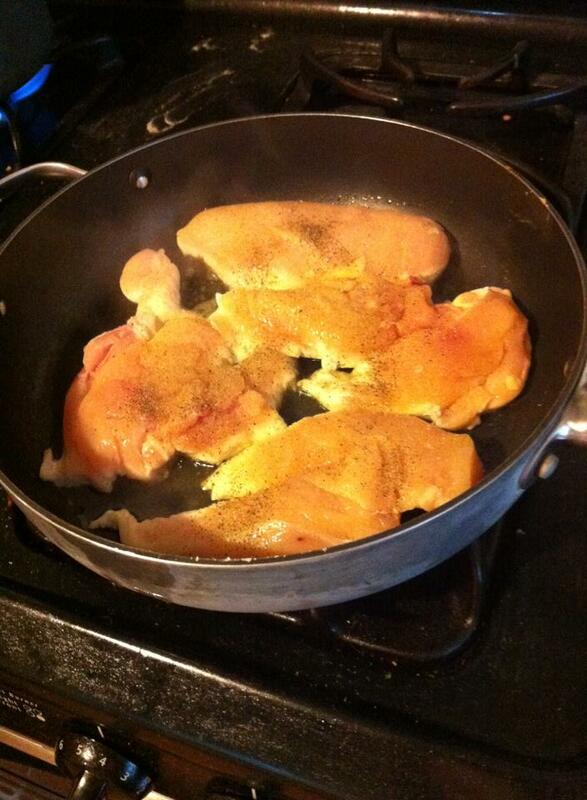 olive oil in fry pan and cook chicken just until cooked through, about 4 minutes a side. Transfer chicken to a foil covered baking sheet. Top with pepper strips, cheese rounds and toasted almond slices. Bake chicken just until cheese is heated through, about 5 minutes. Transfer to plates. 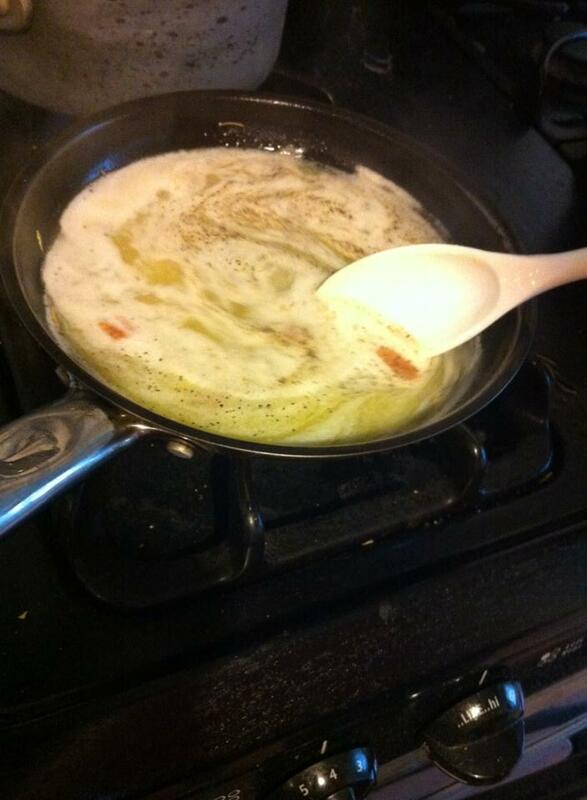 Meanwhile, heat remaining ¼ cup olive oil in the fry pan over high heat. Add shallots and garlic and sauté 30 seconds. Add wine and rosemary and boil until reduced by half, about 3 minutes. Gradually whisk in butter. Season to taste with salt and pepper. While listing out all the local places I love, I came to an impasse: Vitek’s? or Uncle Dan’s? The question about whose barbecue is best surfaces occasionally, becomes a heated debate, and then disappears as the individuals become preoccupied with eating the barbecue of their choice. On one hand, you have the tender, delicious brisket and ribs at Uncle Dan’s. Everything is cooked to perfection and the barbecue sauce rocks. On the other hand, you have the Gut Pak – the undisputed king of college eats – and all of Vitek’s fantastic homemade sausage. Aaron loves the sausage so much he drove out to Vitek’s to add it to his gumbo for family dinner. 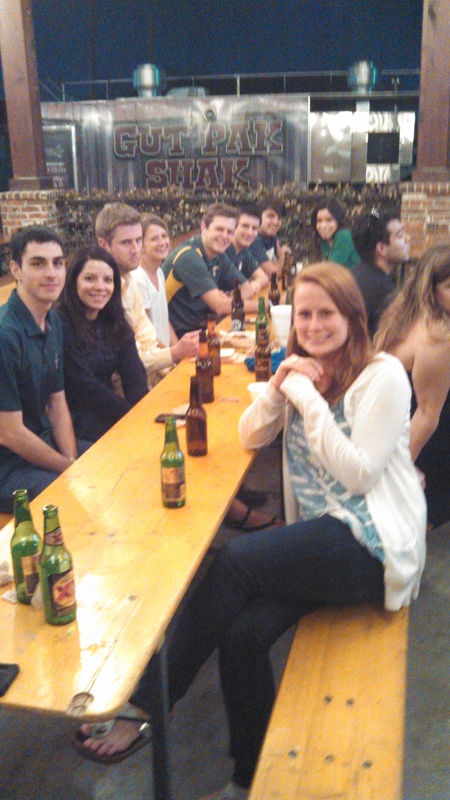 We watched the Baylor-Wisconsin game on the Vitek’s patio. Aaron refused to pretend to be happy. How do I decide where to go? Honestly it just depends on which side of town I’m on. Is that a cop-out? Sort of. But I’m just a man who loves good food – something Vitek’s and Uncle Dan’s both have in spades.